﻿Explore the world of animals with Ann Southcombe, who devoted 35 years working with a wide range of animals and has been seen on "Nova" and in "National Geographics" In June 2014 she will be seen in a PBS TV series, "My Wild Life"- "The Ape who went to college"
In 2016 she was included in the PBS special, "Koko the gorilla who talks". You will experience Ann's world as you travel from zoos, universities, rescue ranches, the jungles of South America and wildlife rehabilitation centers. 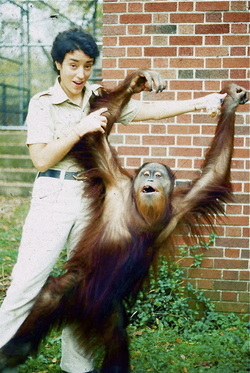 In 1970 Ann was the second woman to be hired at the Cincinnati Zoo as a full time keeper. IN 1978 she began working with the now famous gorillas, "Koko and Michael" in a language studies program at Stanford University. She spent seven years working with a young orangutan at the University of Tennessee at Chattanooga. Ann's greatest hope is that by sharing her experiences, each viewer can leave with recognition of the oneness of all life and a greater appreciation of our need to live in harmony and compassion for all earth's inhabitants.